Brothers Chris and Kyle Bolton, author and illustrator, respectively, of the “Smash” series of graphic novels, have created a wonderfully funny and action-packed new addition to the realm of middle-grade comics. I absolutely love the wonderful combination of story and art in the “Smash” books....I particularly enjoy Kyle’s artwork; it combines the goofiness of cult classics like the Tick with the youthful vigor of Bill Watterson’s Calvin and Hobbes. Every panel is filled with the energy of a 10-year-old boy, with characters ready to bounce right off the page. The text is challenging enough to engage a competent middle-grade reader but still accessible, hitting the perfect balance of being appealing and chortle-inducing while not raising too many parental eyebrows. And the warmth of the story, with its focus on familial relationships and the struggles that all kids face, gives it a universal appeal. It’s a good time to be a young reader, with so many franchises aimed at the under-18 crowd. The “Smash” series is an exciting, compelling addition to the once-overlooked field of comics for kids, sure to appeal to everyone from fans of Iron Man to Wimpy Kid devotees. Click here to read the full review! And if you're in the neighborhood, we'll be reading at the celebrated Inklings Bookshop in Yakima, Washington, on Saturday, July7th, at 2pm. Drop in and say hello! Help Spread the Word About SMASH! Now that SMASH 2: FEARLESS is out in the world, we want to know what you think! It also helps us get the word out to new readers, so please consider writing a review for Goodreads or Amazon. It's fast, easy, and fun—and only takes a couple of minutes to share the love for SMASH! The ensuing action is fast, furious, and interrupted only occasionally by scenes at home and the introduction of Jae Kim, a smart and lively new Korean-American classmate....[Smash] continues to lead a diverse and expressively drawn cast. Brisk, nonstop, chock-full of awesome exploits. Click here for the full review. Don't forget: publication date is May 8th! Not long ago, we made a short webcomic called "Monstrous" to tide over Smash fans until Book 2 comes out. Well, we were happily surprised to find out the Comics Alternative podcast gave "Monstrous" a wonderful review. (Thanks, guys!) Click here to give it a listen. Thank You for a SMASH-ing 2014! Happy New Year to all our SMASH readers! As the calendar switches over to 2015, Kyle and I can't help looking back at a wonderful year for our 10-year-old superhero. Numerous awards for SMASH: TRIAL BY FIRE, from the Oregon Spirit Book Award to the Children's Choice Book Award and a nomination for the Black-Eyed Susan Award. A wonderful experience at the Emerald City Comic Con, including panels with other kids' comic creators and a demonstration on how kids can make their own comics. 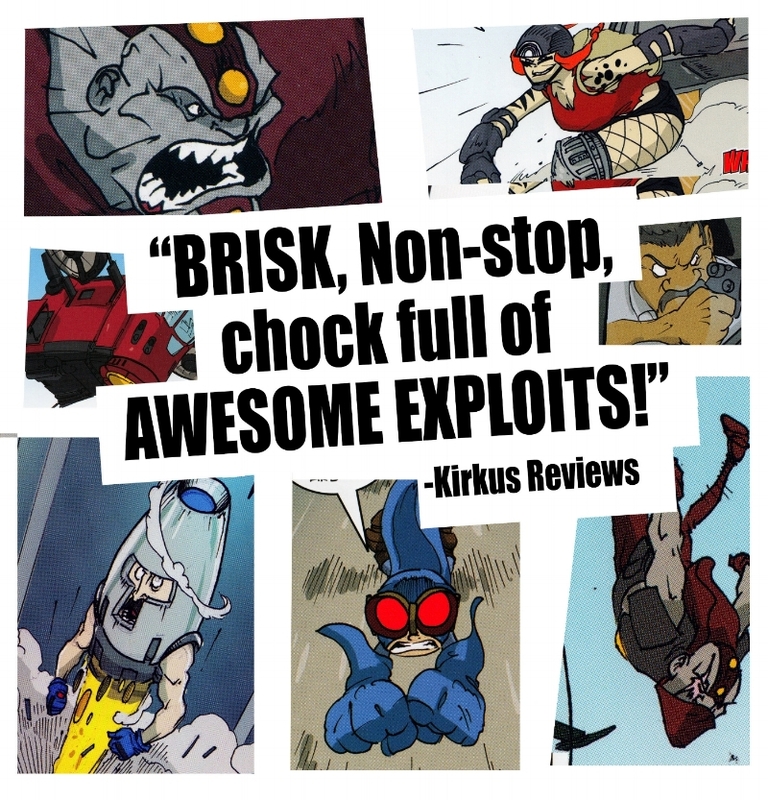 More fantastic reviews for our graphic novel, including notices from Horn Book, Bookslut, Library Media Connection, and many more. The blog 100 Scope Notes even called TRIAL BY FIRE one of the Top 10 Circulated Books of 2014. Most of all, we're grateful for all of you! By buying our book and sharing our creation with friends and family, you've helped spread the word about SMASH in ways we could only have dreamed about. We have exciting announcements coming in early 2015! But first, we want to reflect back on 2014 and say thanks again. May you all have a wonderful and joyous New Year celebration! SMASH Picked by the Children's Choice Book Awards! It's been nearly a year since SMASH: Trial by Fire was published by Candlewick Press. And what a year it's been! In just nine short months, we've received a flurry of fantastic reviews and numerous award nominations, including winning the 2013 Oregon Spirit Book Award. The reading list kids pick! Each year, 12,500 children from different regions of the United States read newly-published children's and young adult trade books and vote for the ones they like best! The Children's Book Council has overseen the awards for over 70 years. Kyle and I couldn't be more honored to be selected by the most prestigious group of judges in the world — actual kids! Huge thanks to the Children's Book Council for promoting such a worthy endeavor — and, of course, to all the young readers who voted. If you haven't gotten a copy of SMASH: Trial by Fire for yourself or a young reader in your life, click on one of the links in the right-hand margin and order now. It's the perfect summertime read. And if you don't believe us, just ask the kids who voted! SMASH Wins the 2013 Oregon Spirit Book Award! We are thrilled to announce that SMASH: Trial by Fire has been named the winner in the Graphic Novels category of the 2013 Oregon Spirit Book Award by the Oregon Council of Teachers of English. The Oregon Spirit Book Award is given yearly to the author of a distinguished contribution to picture books, middle reader, young adult, graphic novels, or non-­fiction literature...reflecting the spirit and values help by Oregonians. This is a tremendous honor for us. Kyle and I are hugely flattered, and want to thank the Oregon Council of Teachers of English, as well as all our wonderful readers. We couldn't have done it without your support! Great Review: SMASH "Made My Day!" I am always on the hunt for a great graphic novels for elementary students. The catch is that they must have quality artwork and a quality story, all while staying G rated. It’s a tricky bill to fit and this graphic novel does a fantastic job. The cover art itself is so great that students are going to be fighting over this. The illustrations are top notch: bright, fun, action packed, and creative. The story will relate to any student who would like to try to their hand at superhero powers. Hooray, this book made my day! A must have for any graphic novel collection! To order your copy of Smash, click on any of the links in the margin to the right! Another Great Review for SMASH! SMASH: TRIAL BY FIRE just got a great write-up on the website Bookslut (don't worry, it's safe to read!) from ace blogger Colleen Mondor, who calls it "a funny story with bright artwork and a nice wide size that early readers should enjoy exploring on their own." SMASH has a lot of humor....[Chris] Bolton makes Andrew extremely believable and lets him fulfill a few kid fantasies along with the more serious hero stuff. Kyle Bolton's artwork is perfect; the faces are very expressive, and he captures Andrew's alternately confident and overwhelmed expressions with aplomb. Elementary-schoolers are going to get a lot of joy out of this one, and I hope a sequel, set up by the final pages, will be released soon. Click here to read the whole column. Thanks, Colleen! And you can check out more reviews for SMASH right here. Give the Gift of SMASH! 'Tis the season for hunting down the perfect gift for everyone you know and love. If someone on your shopping list craves adventure, humor, fantasy, and a fast-paced story with unforgettable characters, pick up a copy of SMASH: TRIAL BY FIRE! A Junior Library Guild Selection and 2014 Great Graphic Novels for Teens nominee, SMASH: TRIAL BY FIRE brings every child's superhero fantasy to life with action, humor, and eye-popping artwork. This holiday season, share the magic — and help Santa delight your loved ones with a gift they'll never forget! Available at Barnes & Noble stores or your favorite independent bookseller, you can also find SMASH online at Amazon, Indie Bound, and Powells.com.